Our longitudinal project investigates second-language learning pedagogy in two different contexts; a secondary school in the UK and an all-age school in Spain. Comparing motivation, attitudes and pedagogy for language learning between UK and Spain is yielding valuable insights into the complex influences of socio-educational context that have potential for widespread application. The project had a dual focus: 11-12 year old pupils’ attitudes to and motivation for learning another language; and teachers’ developing understanding of the pedagogic potential of iPads for language learning. The teachers in our project were concerned about motivation for learning a second language in general and in boys in particular, and in the development of pupils’ confidence in speaking in the language they were learning. They wanted to see how the introduction of technology, namely iPads with their capacity to run many different apps, might affect learning and motivation. A sociocultural approach characterising language learning as emerging not through interaction but in interaction (Ellis, 2000) is reflected in many aspects of our project. 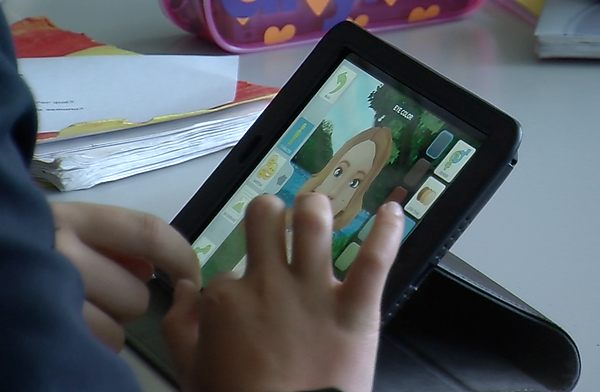 Researchers and teachers in the UK and Spain worked together to plan lessons to teach Spanish, English and French to 11/12 year olds, using generic iPad apps including apps to make animations. Pupils worked together using particular apps learning as they interacted with each other and with their teachers; in addition teachers from the two countries learned from watching and talking to each other, and from interactions with local authority personnel and academics also involved in the project. The cross-national element of the project led to swapping lesson plans and video recordings of each other’s lessons gave teachers insight into their own practice and how it was different from the practice of their counterparts in the other country, thereby surfacing the taken for granted, encouraging reflection and reshaping research questions. ​​​Most pupils in both countries thought iPads made all work easier and more enjoyable, but there is an emerging effect of gender in pupils’ comments and rating of work with iPads; they commented that learning languages takes effort, and that girls are more likely to put in effort than boys. This seems to suggest that language learning might become gendered because it requires effort and girls more likely to put in effort than boys. The effort displayed by boys in the project as they put together their animations, however, suggests that ICT might help to offset the gendering effect of effort. Boys surprise themselves working with iPads; "using Puppet Pals [an animation app] just makes it more relaxed … it’s easier when you’re not focusing as much on the speaking, and it just comes more naturally, instead of really focusing on it". iPads appear to offer a tech distraction which appeals to boys, while for girls the embarrassment of speaking in public in another language was mitigated by an avatar effect. Comparison with comments from Spanish pupils about the purpose of L2 learning also points to a possible effect of perceived trajectories; in the current times of financial austerity and unemployment, Spanish pupils were more motivated to put in effort because they could see more clearly a future in which they might need a second language to help secure a job. Adopting a broad sociocultural approach to data analysis is therefore revealing the importance of taking context into account when planning L2 teaching and learning – but is also suggesting the need to set this learning in context for parents and pupils, particularly in countries like UK where L2 learning in later school years is in decline. Acknowledgement: we are most grateful for the research collaboration with L2 teachers from schools in Devon, UK and Galicia, Spain, their colleagues and pupils. This project was funded by the EU Regio Comenius programme. Poland, R. Baggott la Velle, LM, and Nichol, JD. (2003) The Virtual Field Station (VFS): using a virtual reality environment for ecological fieldwork in A-level biological studies. British Journal of Educational Technology, 34 (2) 215-232​.